Microsoft have updated FolderShare, their online, file synchronization service and look to be making it a part of the Windows Live service. 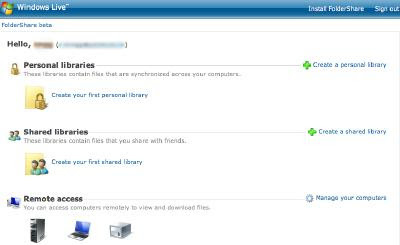 FolderShare allows you to register one or more computers with the service and you can then set up personal and/or shared file libraries and also remotely access your computer's hard drive(s). I tried it out some time ago and it did seem to work okay to a point. I could access my work computer drive from home and vice versa but it did tend to time out quite a bit and lose connection. Hopefully this update may have improved the system although I noticed that they've updated the Windows version but there been no change in the Mac OS X client. The improvemenets listed are a new website for easier library and computer management, improved performance on Windows Vista, better setup and improved system tray integration as well as backend improvements to keep FolderShare running more reliably. There are other ways to synchronize files over a network but FolderShare is free so it's definitely worth checking out.